Before you open a Roth IRA, you need to know the basics. Remember, ignorance is NOT bliss. And when it comes to your Roth IRA, hurt usually manifests itself in the form of taxes and penalties. So what are the basic rules? Fortunately, the IRS keeps the Roth IRA rules pretty simple. Learn what the IRS says about the Roth IRA rules for each of these topics, and you'll know just about everything you ever need to know about the rules governing your Roth IRA. In essence, only two eligibility requirements exist, and they both involve income. First, you must have earned income before you can contribute to your Roth IRA. Once you have earned income, you're eligible to make a Roth IRA contribution assuming you're in compliance with the Roth IRA rules regarding your income level. Depending on your tax filing status, you may be ineligible to contribute if your income is above a specified level. But the Roth IRA income rules will be addressed in greater detail momentarily. Roth IRA rules limit your eligibility to open a new Roth IRA or contribute to an existing one based on where your income falls within a predetermined range. Your "income" in the eyes of the IRS is the same as your Modified Adjusted Gross Income (MAGI). It's nothing more than government bureaucrat language which means "your personal income." Look at your IRS Form 1040 (the one you use for filing income taxes). Find the number for Adjusted Gross Income (AGI). Once you add back certain items to your AGI, you'll come up with a figure for your MAGI. Then you'll be able to see if you meet the income limits for a Roth IRA. Click here to learn more about Modified Adjusted Gross Income (MAGI) and how to calculate it. $179,000 for married individuals who file a joint tax return. Married filing separately and did not live with their spouse at any time during the course of the tax year. One of the first Roth IRA rules you'll learn is that you must fund your contributions with after-tax income. Unlike a traditional IRA, a Roth IRA is NOT tax deductible. However, this disadvantage is easily offset by the future tax-free growth and tax-free withdrawal of those same contributions. Once you fund a Roth IRA, you never have to pay income taxes or capital gains taxes on the invested funds or subsequent investment gains ever again! For example, let's say you fund your Roth IRA with $1,000 in after-tax income. You use that money to purchase $1,000 worth of stock. After three years, the stock is worth $2,000. But instead of paying capital gains tax on the $1,000 gain, you pay zero tax. You can then reinvest the entire $2,000 in something new. Thirty years later, when the $1,000 is worth $15,000, you can withdraw the entire $15,000 and not owe a single penny in taxes! 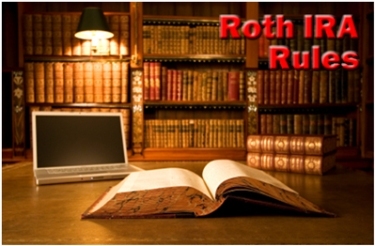 Roth IRA rules limit the annual contribution you can make to your account. Unlike a traditional IRA, you can withdraw previously contributed principal payments from a Roth IRA without incurring an early withdrawal penalty. For example, let's say you open a Roth IRA and contribute $2,000. One year later, the account is worth $2,500. But the $500 investment gain can't be touched. Withdrawals of investment gains are a different story, though. However, there are exceptions to these rules. They allow you to make early withdrawals without paying a penalty if your withdrawals are for certain things, such as funding education expenses or the purchase of a first home. But let's take a more in-depth look at the two requirements you must meet - the Roth IRA 5 year rule and age 59 ½. Before you can make tax-free, penalty-free withdrawals of investment gains, rollover funds, or conversion funds from your Roth IRA, you must meet the requirements of the 5 year rule. It's one of the most important Roth IRA rules, and it states that you must open and fund your account for at least 5 tax years before you can withdraw funds (other than your original contributions) tax-free and penalty-free. The five year clock starts ticking in the same tax year in which you make your first contribution. So if you open a Roth IRA and make an initial $5,000 contribution for the 2012 tax year, then you'll meet the requirements of the five year rule in 2017. Because five tax years have passed. 2012, 2013, 2014, 2015, and 2016. Roth IRA rules don't dictate a minimum or a maximum age for opening or investing in a Roth IRA. While the range of asset classes is wide and varying, not every traditional investment option is available for your Roth IRA. The Roth IRA rules also dictate the parameters for converting your 401k, Traditional IRA, or other tax-sheltered retirement plan to a Roth IRA. Of course, you owe income taxes on investment gains and/or any pre-tax contributions you made to those plans prior to the rollover. Make sure you know the Roth IRA IRS rules before you jump head first into Roth IRA investing. If you have a question about the rules, and you can't find the answer, use the "Search This Site" field in the upper lefthand corner. Our site is adding new information and resources on a regular basis, so you should be able to find the answer to your Roth IRA questions here.